My first “Bike Fit Basics” post talked about how a given frame size means almost nothing — it’s kind of a myth, or a nonsensical arbitrary number. We settled on two other basic measurements you can use to get a feel for if a bike may fit you — standover and effective top tube. The blue line shows the effective top tube measurement. In this post I’ll talk about two other measurements that can dramatically affect how far away the bars feel while you’re sitting on the bike — “stack” and “reach”. I still believe that nothing beats an in-person fit with an expert, but if you read up on the terms you’ll be better versed to compare bikes on your own and advocate for what you want. Let’s talk about “stack” first because I think it’s easier to explain. Stack is the vertical distance from the bottom bracket to the top of the head tube. It helps you understand how “tall” a frame is. See the blue lines above. 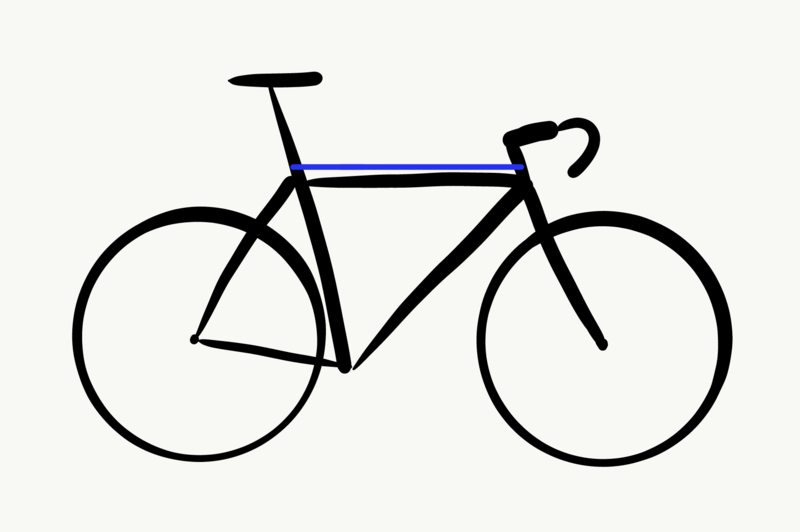 I tried to draw the bikes with the same wheelbase or total length and very similar effective top tube measurements. However, the huge difference in stack will really affect how they feel when you ride them. The bike on the left is more like my endurance, all-road bike and has the higher “stack” of the two bikes I’ve drawn. It is made to be comfier and keep the rider in a more upright position, which is a godsend after spinal surgery and my newfound inflexibility. Some people prefer this style of bike for long rides. The bike on the right has a much lower stack, putting the rider in a more aero position where the torso catches less wind. The bars seem further away and you have to bend more at the waist and hips to reach the bars. This is more like your typical road racing bike geometry. HOWEVER, I have ridden my “criterium” bike styled like the one on the right for many long endurance rides and loved it, especially when I wanted to get the miles done faster. One ride was a 160 mile test ride across southern Minnesota and into Iowa, and then later that year the goal ride of a 265 mile pavement trek across Iowa in one day. All I did was swap out the saddle for something more cushy, adjust saddle height to compensate for the added padding, then strapped on a metric crap ton of bags. It worked amazingly well for me. I think you should ride what you like and what makes you feel most comfortable, tradition be damned. The hard part is testing enough things to figure out what’s working for you at this stage of your cycling. Learning more about stack in the past year blew my mind. I looked through all of the bikes I had purchased in the years before, and by chance or luck most had nearly identical stack measurements even though I owned a collection of road and gravel bikes. I had to learn a lot more about stack because after spine surgery I wasn’t initially very flexible and didn’t want to make severe modifications to my existing fleet. I’d argue that stack is the 3rd most important measurement when looking at drop bar frames. I think you should ride what you like and what makes you feel most comfortable, tradition be damned. The hard part is testing enough things to figure out what’s working for you at this stage of your cycling. Now let’s discuss “Reach” using the same diagram as above. Reach is the horizontal distance from the bottom bracket to the top center of the head tube. Blah blah blah. I show this in green above, drawing a vertical line up from the bottom bracket and intersecting with an imaginary point where the top of the head tube is. It’s hard to see, but on the “endurance” bike on the left side, the reach is a little shorter. Because the bars are higher, they slope inward towards the rider more and feel closer not just because of their height relative to the rider, but also because they are horizontally closer. The “racier” bike on the left has a slightly longer reach, putting the rider in a more stretched out, aero position. Some say it is less comfortable for them. I like being lower, as it helps me conserve even more energy when riding with taller riders since I’m so scrunched down. Last post, I killed your dream of being able to walk into any shop and say “hey, I ride a 50 cm frame, what do you have in stock?” and getting a slew of bikes that fit. We talked about standover and top tube length and how frame size is arbitrary and usually meaningless in modern frame design. Today I’ve messed up the system AGAIN by adding two more measurements that increase the complexity, but hopefully also improve your understanding of why bikes with identical top tube measurements may feel completely different. The next post in the series will talk about fine-tuning your fit once you already have the bike — think stem options, saddle fore/aft position, crank length, handlebars. (Sorry kids, I’m not ready to get into saddle specifics unless you beg or bribe. I like coffee and craft beer.) What are some tricks for modifying a bike once you have it? Are you stuck with how it feels, or can you adapt it to be closer to ideal? Message me your thoughts and I’ll summarize them on the next post! If you want to get my next post delivered to your inbox, sign up with your email below and/or follow my Facebook page! Suggestions and tips always welcome. What would you like to see me talk about next? Loving these posts Melissa! You may have blown my “standard sizing” dream but at the same time you opened up the possibility that because I am a small rider I am not SOL if there is no 45 or 46 or xs frame size. Question: How adjustable is reach? Obviously you can’t change the frame, but I’ve test ridden bikes where the reach was just a little too far for comfort on the smallest frame size. Are there adjustments that can be made and even if there are, is it worth it? YES there are definitely options! It’s not ideal, but if you’re like me I try and buy used bikes when I can due to affordability. I can’t always find EXACTLY what I need so I’ve learned some tricks. I’ll talk about that in the third installment of the series. I expect I’ll post that in about 2 weeks as I’ll need some surgery down-time. Another surgery? I hope it goes well!